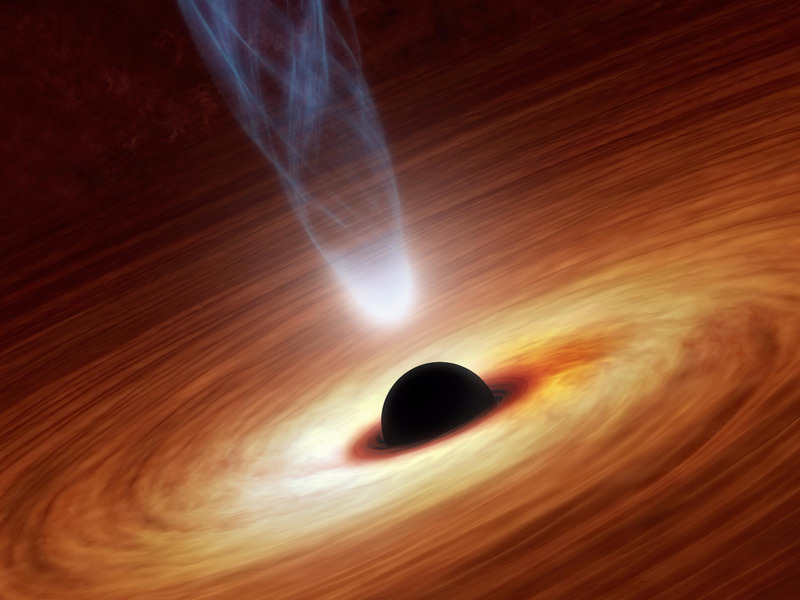 NASA/JPL/CaltechArtist’s impression of a black hole. Are you worried about the bond market? Maybe you should be. 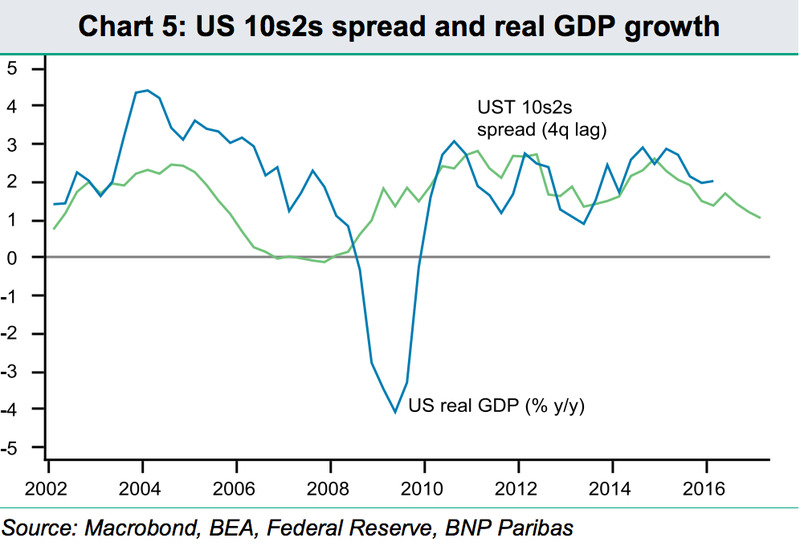 At least that’s according to Paul Mortimer-Lee, chief North America economist at BNP-Paribas, who said that the bond market is not painting a pretty picture for the economy right now. 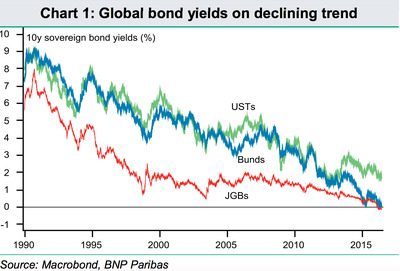 “The apparently inexorable downward trend in bond yields seems to suggest a black hole, with bond yields collapsing in on themselves, pulled down by an intense gravitational force,” wrote Mortimer-Lee in a note to clients. Rather than monetary policy, Mortimer-Lee believes the bond market is reflecting short-term concerns like the political instability in Spain, the UK referendum on leaving the European Union, and the weak payrolls number. Adding on to those issues are long-term concerns that have been dragging down yields for some time. “It seems to us that signs of US economic weakness are behind the shift in bond yields, aided and abetted by the failure of the Chinese economy to respond significantly in the upside following major stimulus,” said the note. Mortimer-Lee also asserted that going forward, these low rates reveal a worrying trend in investor confidence. Higher yields (in theory) should reflect the prospects for long-term growth and economic health. By being this low, in Mortimer-Lee’s opinion, investors are expressing serious concerns over the financial stability of global economies. 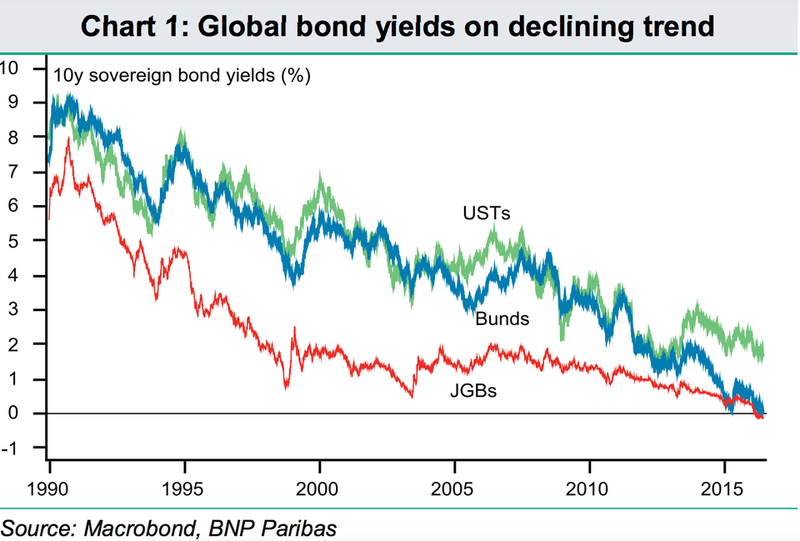 In addition, the trend of rates for long-term bonds sinking to levels near those of short-term bonds, also referred to as a flattening of the yield curve, presents concerns. Bond yields are inherently forward-looking. The bull flattening we have seen is not a good sign, because it signals less faith in future growth and/or inflation prospects. 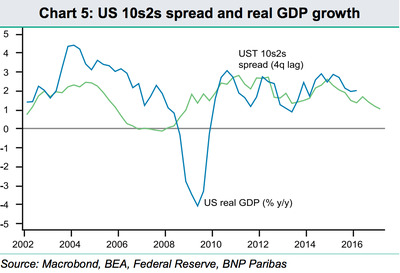 Chart 5 looks at US GDP growth and the shape of the US curve. It seems to suggest a lead of about a year between shifts in the curve and subsequent growth performance (measured year on year). Viewed in this light, the recent flattening of the bond curve looks worrying, since it seems to foreshadow a further slowdown in activity over coming months. The inversion of the yield curve, or the yield of ten-year bonds falling below that of two-year bonds, has been noted as one of the most reliable predictors of a US recession. So as this gets closer to happening, recession fears may bubble up. All in all, it is simply bad news from the bond markets said Mortimer Lee. “Risk markets have often treated ‘bad news as good news’ in that weaker US activity signals a more accommodative Fed,” said Mortimer-Lee.